Hello all. Sorry it has been so long since I've posted, but you're in for a long one here. Zoe and I left early Sunday morning for Utah. She was so good on the flight there, she slept all but about 30 seconds. Here she is ready to fly. For those of you that don't know, the 4th of July in my family is bigger than Christmas. 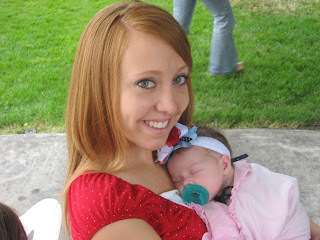 We always get together in Provo at my Grandparents house to enjoy the freedom festival that Provo puts on. This year we got to introduce Zoe to my extended family and this wonderful tradition. I spent Sunday- Wednesday spending time with my family, while Ryan stayed home in California and worked, and then he joined me Wednesday night. Thank goodness for Parents. 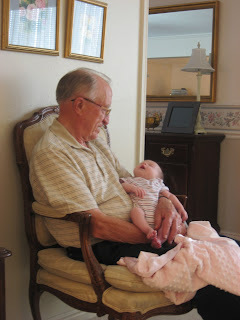 Zoe had a couple of rough nights and my parents were so wonderful and got up in the middle of the night with her. I bet they thought their nights of changing diapers and midnight feedings were over, but I'm grateful they were wrong, and helped me out. It was interesting, even though I was with my parents and siblings, being without Ryan made me feel like a single parent, a feeling I'm glad was only temporary. 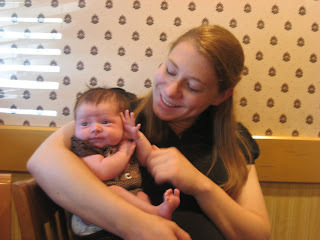 While I was there, Zoe got to meet her Best Friend (as decided by her mother). 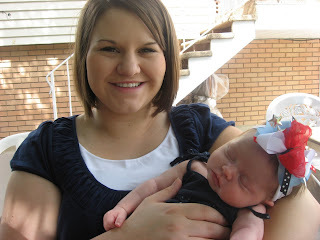 My best friend from High School, Heather, had her baby girl in March. Zoe and Brooke got to meet for the first time this trip. Zoe got to meet her Papa, Aunt Jenni, Uncle Aaron, Aunt Natalie and Uncle Ben. 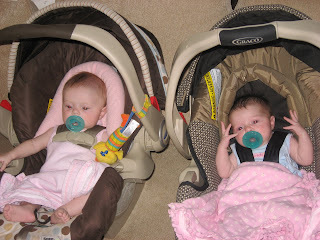 (She got to see Nona, but she already met Nona when she was born) Zoe also got to meet her cousin Noah, well sort of. Noah is due in just a few weeks. Every time Jenni would hold Zoe on her belly, Noah would kick, I'm hoping that means that he's excited to meet her. Zoe with Jenni Natalie with Zoe Zoe with Great Grandpa Morgan Zoe with Great Grandma Morgan While we were in Utah, my Uncle Chris introduced us to an authentic Italian Pizzeria in Salt Lake City, called Settebello. It was delicious. (Italy is a very big deal in my family too) Here's there site I would definitely recommend it if you are in the downtown Salt Lake Area. Zoe smiled for the first time July 1st. That was a great moment, I just wish she would do it more often. She has also started to really hold her head up. 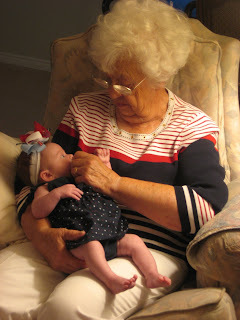 Here's me and Zoe on the 4th. 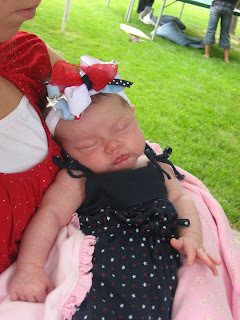 and here's our beautiful little girl, in her firecracker of a bow. We're home now, and Zoe is having a hard time adjusting to not being held all the time, so we've had a few rough nights. 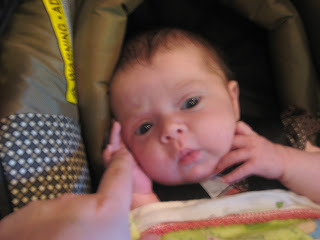 Zoe is now a month old. I can't believe it. She has grown so much. It's hard to imagine life without her now. We love her so much. I just wanted to say thanks to all our family and friends for the support, the dinners, the gifts and sweet words. It's great to know that Zoe has so many people that love her already. More to come soon, XOXO, Holly & Co.
Yeah, so I pretty much have the cutest niece ever...Noah is staying put at present, so she has no cousin to play with yet. I'll let you know when that changes. Love you! 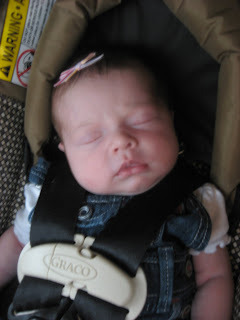 zoe is soo sweet, i love her big head band thingy...hey dont blam me i have a boy! ha ha well shes just so darn cute!